This sterling silver Celtic wedding band features engraved knot-work along with 10K gold and one diamond. The woman's Celtic band measures 1/4 tall; the knot-work motif is continuous around the back. 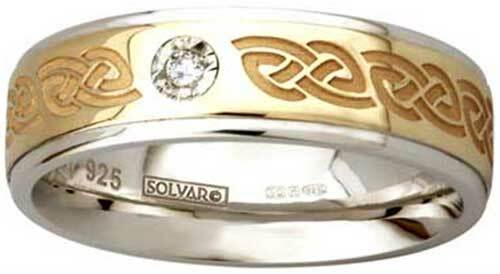 Celtic wedding band is a men's sterling silver size that is accented with 10K gold along with engraved Trinity knots. 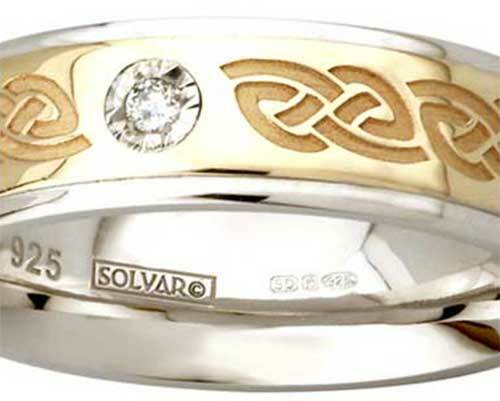 Celtic wedding band features a sterling silver women's size that is enhanced with engraved gold Trinity knots.